At the Ghim Moh hawker centre on a Wednesday morning. Ever since I moved to this neighbourhood, I’ve felt its heart to be the Ghim Moh wet market and hawker centre. The pulse of life in this estate seems to run strong between the different food and dry good stalls, and at the same time there was a quaint charm about it that gave character to this part of Ghim Moh. I was dismayed to learn that the old market would have to close for renovation for around a year, but a temporary market has sprung up to house the hawkers and stallholders, and more importantly to cater to the needs of residents looking for soul food. Gone were the pale blue tables with browned edges, to be replaced by new orange plastic ones plastered with slogans. The size of the hawker centre had also decreased, causing the cooked food stalls to bristle out next to each other against the small lanes. 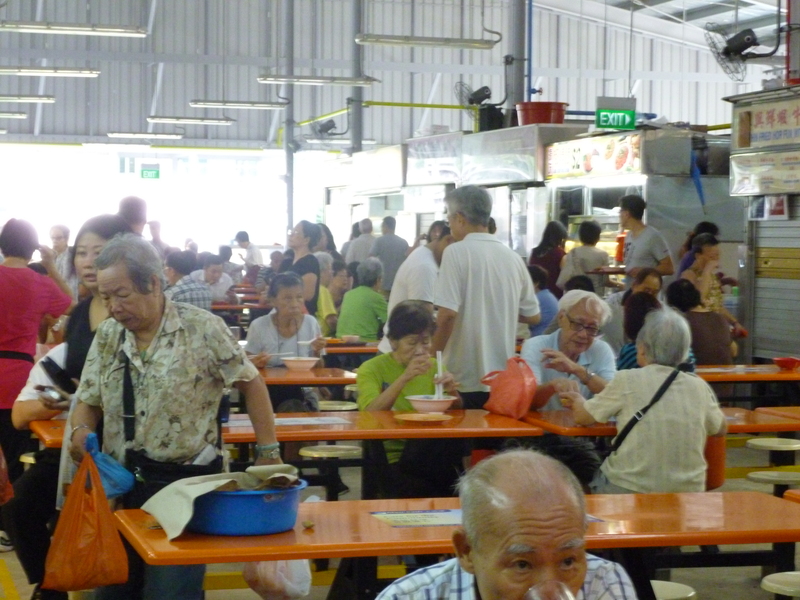 Whereas before there were sprawling avenues between the stalls, now walking through the hawker centre on a crowded morning feels stifling as human traffic clogs up the new narrow thoroughfares. Some of the hawkers had also chosen not to sell their food during this period, causing the market to be short of some of its best hawker food. Fortunately this won’t be a permanent state of affairs and some things haven’t changed–the presence of the humorous vegetable seller firing off rapid calculations in Hokkien as he counts his earnings, the steadfast assistant at the prawn mee (noodles) stall greeting passers-by with his serene smile, and the colourful diversity of dry goods stalls selling everything from seafood to clothing to paper money and goods used for Chinese ancestral worship rites. I have only visited the temporary market once since it commenced operations a little while ago. The image of the old market with its rustic elegance is still imprinted on my heart, so it still feels a little unreal for me that it’s going to be given a facelift and moulded into something completely different. Though most of its familiar faces will still be around by the time the new market is ready, I can’t help but feel there’s already been part of it that has been irreparably changed.